In a house that is only 875 square feet, every extra inch counts. Even though the closet in the master bedroom was about 6 feet wide, it only had a 24 inch door, hampering access to much of the storage. By widening the doorway for bi-fold doors and installing a closet organizer, I was able to increase the useful storage space. However, it must be noted here that I DID NOT structure the doorway properly. The construction techniques I present here are wrong! I have published this project only to show what I did. The idea was good, but clearly I did not know as much as I thought I knew, a problem that I share in common with lot of self-proclaimed do-it-yourselfers. Wide closet, but narrow door. When I bought the house, I was single and there was more than enough room to spread my “stuff” throughout the three bedrooms. Once I became engaged, it became apparent that I needed to use any available space much more efficiently. The master bedroom had a wall closet about 5 and a half feet wide with a standard depth. Access to this closet was originally through a door that was only 24 inches wide. At least half of the space in the closet was inconvenient, if not impossible, to access. The solution? Widen the doorway and install two 30 inch bi-fold doors to access the entire closet. After ensuring that I would not be messing with a supporting wall, I went to work inside the closet. The walls were gypsum board and plaster and were up to an inch thick in places so my stud finder was not able to accurately detect the studs. I had to open the wall up to find the studs the old fashioned way. I carefully used a keyhole saw to cut a couple of holes inside the closet so I could see exactly what framing I was working with. My stud finder is able to detect electrical current and I was able to determine that no wires were present where I was cutting. Still, I carefully opened up a couple larger holes just to be sure. Once I confirmed that it was safe to do so, I used a reciprocating saw to cut the wall board flush to the studs that were not going to be removed. It was a messy job to say the least. 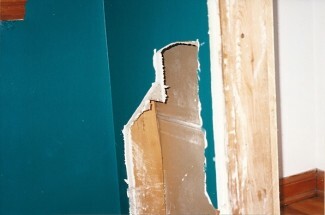 The rough opening of the closet. 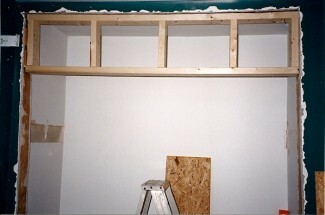 The wall board was removed up to the top plate that was attached to the ceiling joists. A bottom plate was nailed to the floor boards and I now had now exposed couple of 2 x 4 studs. I removed the studs to create the opening that I needed. Now I needed to rebuild the header and do something about the void that was left once the bottom plate was removed from the floor. For the floor, I cut a 1×6 pine board the length of the new opening. I stained the board with the same walnut stain that I used on the bi-fold doors. Using a circular saw set to the depth of the hardwood flooring, I cut out a section to the width of the board. I then simply nailed the new board in place. The contrasting threshold looks terrific and was a simpler solution than trying to match the hardwood floor. [wc_highlight color=”red”]Please note that the following method is incorrect, and actually a little more complicated than the proper way..[/wc_highlight] I measured the height of the opening and triple-checked my measurements to determine the size of the header I required to result in a rough opening that was the size required by the new bi-fold doors while accounting for the 1×4 boards that I had selected for the frame. I built the header as a separate module from the structure and then attached it with many three-inch screws. Fortunately, the top plate was level, so all I had to do was screw the new header to it. The sides were shimmed to provide a good surface for the screws to go into. A gorilla could swing off of this thing and not pull it down and it is certainly strong enough to support bi-fold doors. It is actually the pivot points on the floor that bears most of the weight of the doors. The proper way to frame around an opening for a door or window. The proper way to frame a door opening. Graphic courtesy of Architectionary. Used with permission. 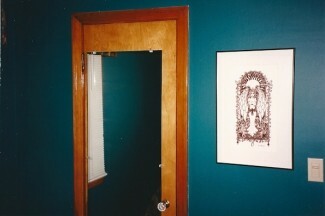 Whether the opening is for a door or a window, the framing technique is the same. 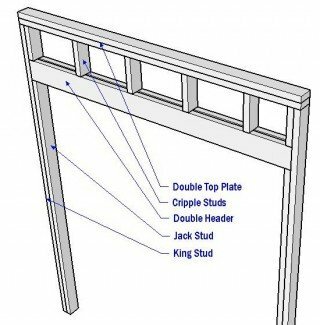 A header, usually a pair of boards at least 2×6 or 2×8 sandwiched together, is supported by jack-studs. 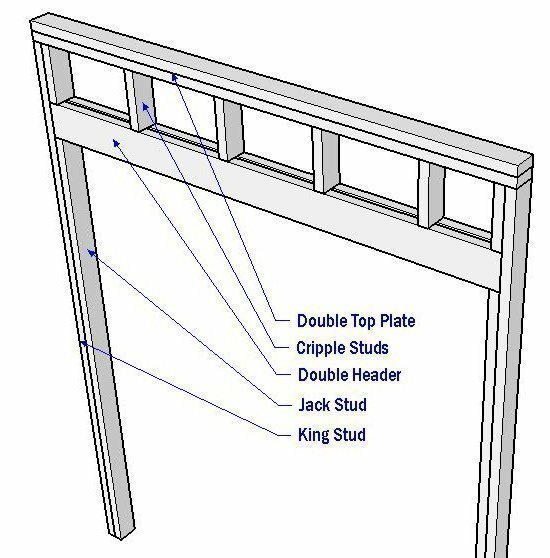 The jack-studs are fastened to king studs which span the height from the bottom plate to the top plate. This structure provides support, effectively replacing the studs that would normally occupy the space of the opening. Although my structure was not proper, it was adequate. The opening was not in a supporting wall. The multiple screws were sufficient to hold my header assembly to the studs. Most of the weight of the bi-fold doors rested on the pivot point on the floor. By my own standards today, adequate is not good enough. I should have researched the proper structure before taking on this renovation. I could have installed smaller doors and had a much stronger structure. Before hanging the drywall, I needed to attach some oriented strand board (OSB) so that the drywall would be flush with the existing wallboard. After three coats of compound and some sanding, the entire wall was primed and painted. Three years later I would hang paint-able textured wallpaper on this one wall to help hide the shortcomings in my workmanship. 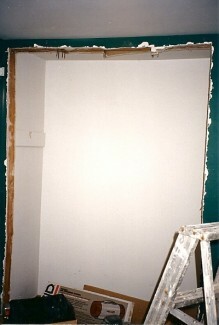 But this was the first time I ever worked with drywall, and for the most part, I believe I did a pretty good job. The bi-fold doors were the pre-primed variety, so to achieve a wood finish, I needed to use a gel stain (I selected walnut). It took a couple of applications of the stain and a couple of coats of polyurethane to achieve the finish you see here. I selected the walnut stain to contrast the finish on the other doors in the house because it would have been impossible to achieve a suitable match. I did get lucky with the stain for the trim. After a lot of trial and error at the paint store, we found a maple stain that closely matched the rest of the woodwork in the house. The style of molding is not an exact match but pretty darn close. 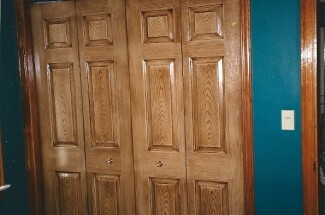 The stained closet doors. Notice how close the new trim matches the original trim to the right. After the dust cleared, I figure that I tripled the useful storage space in the closet. With the wider opening, the entire space is accessible, and a closet organizer increases the storage capacity by another 50%. Considering that this was the first renovation I did inside the house, I am quite proud of the end result. 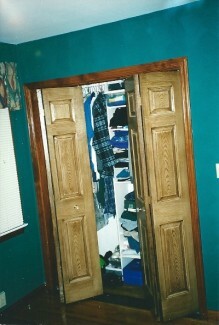 Project completed in 1999, just before my wedding– the obvious reason for needing more closet space.